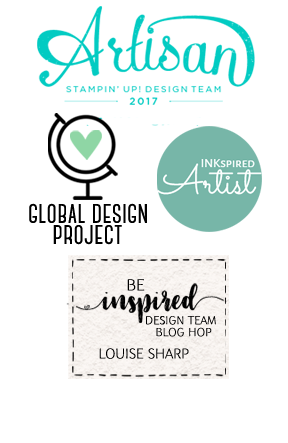 Louise Sharp: InKing Royalty January Blog Hop - Special Guest! 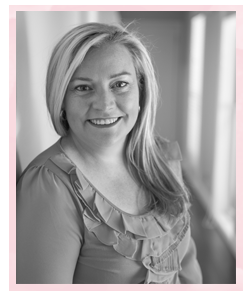 InKing Royalty January Blog Hop - Special Guest! 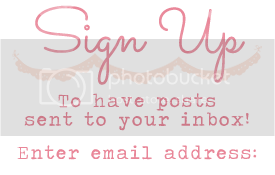 I am so thrilled to be a special guest on the InKing Royalty's January Blog Hop. The theme their team hops this year will be based on popular songs - how fun is that?! 'I Think I Love You' is the theme for this month and now I literally cannot stop singing it! You may have just arrived here from the amazing Shawn de Oliveira. After you read my post, please hop over to the next person on the list at the bottom of this post. 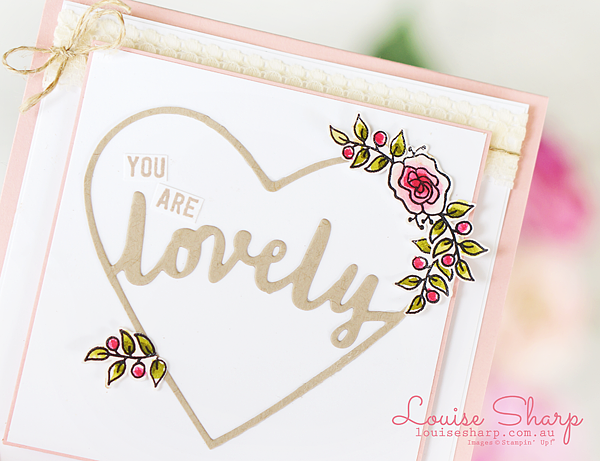 The 'you are lovely' sentiment was created using the Lovely Words Thinlits dies and the Thoughtful Banners stamp set. The flowers are from the Sale-a-Bration stamp set Lots of Lavender. 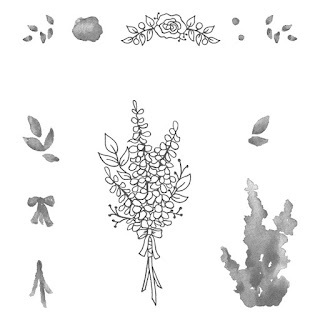 I stamped the flowers twice using Archival Black Ink onto Shimmery White and watercoloured using Melon Mambo and Old Olive. After some careful cutting of them both I adhered one to the top right of the heart. With the second flower I cut off the leaves and discarded the flower (you could place this on the inside) and placed one half of the leaves on the bottom left and the other tucked up under the other flower at the top and placed it so it followed the shape of the heart. 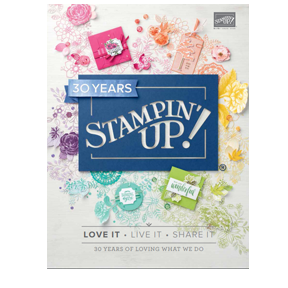 The Lots of Lavender stamp set is a great set to have and the best part is you can earn this for free from the Sale-a-Bration brochure! 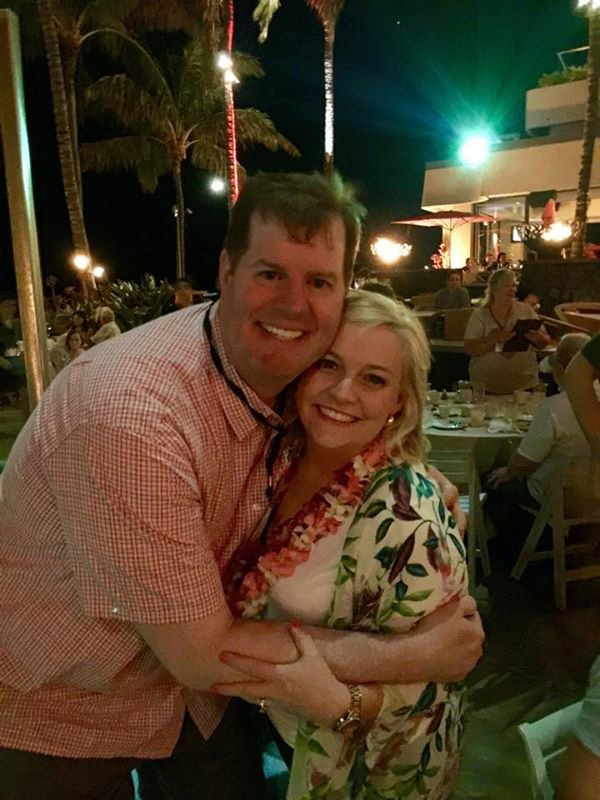 Thanks you so much for visiting me today, I hope you are singing along with me "I Think I Love You" while you're hopping through getting your inspiration for all things love! Now to the next stop on the blog hop, Katie Ferguson. Hi Louise! It is so exciting to have a stamping superstar on Brian’s hop today! Your card is perfect in every way. Your simple style is so appealing to me. Thank you for creating such a beautiful card! This card gives such sweetness and calm to the soul. Love it! 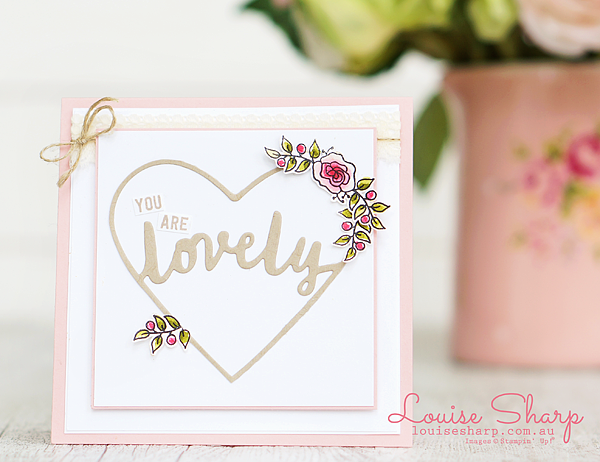 Lovely is so fitting for this "lovely" card. Beautiful work (and photography)! What a beautiful card! I really love how sweet it is! I'm thrilled that you are hopping along with us! Such a awesome card!